Leonard Helman was born November 30, 1926, in Hartford, Connecticut, and passed away on June 6, aged 86. His parents were Abraham and Anna Helman. He is survived by a younger sister, Lila. In 1948, Rabbi Helman graduated Phi Beta Kappa from hometown Trinity College with a bachelor of science in chemistry. He served in the U.S. Army, primarily as a medical technician. While doing graduate work in physiology and teaching high school science in Charlottesville, Virginia, Rabbi Helman met Rabbi Leo Lichtenberg, a renowned scholar who was then the Hillel Foundation rabbi at the University of Virginia. Lichtenberg convinced the young scientist that the rabbinate was his true calling. In 1955, he earned a doctorate of Hebrew letters (Hebrew Union College, Cincinnati) and became a Reform rabbi. He also earned a law degree in 1970 (Duke University). Finding it difficult to combine law and the rabbinate on the East coast, Rabbi Helman took a job in Santa Fe in 1974 and practised law full time, while also a part-time rabbi of Temple Beth Shalom. Temple Beth Shalom had some 60 families as members when he came to Santa Fe. By 1991, when he retired, the congregation consisted of 400 families and a new synagogue had been built on the property. After a short stint in Pennsylvania and Alabama, Helman returned to Santa Fe in 1995 and became the head of Congregation Beit Tikva, a Reform Synagogue. Rabbi Helman’s private life was rich — with friends, hobbies and interests. 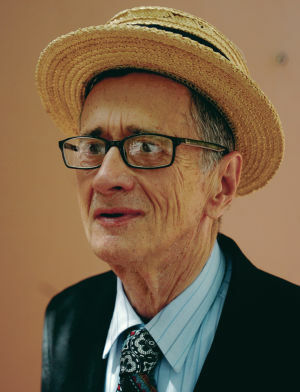 He tap danced, played the piano and was a former chess champion as well as a bridge master; Helman called bridge playing “the Alzheimer’s prevention club.” On opening night at the Santa Fe Opera, that would be Rabbi Helman dancing under the stars with friends. 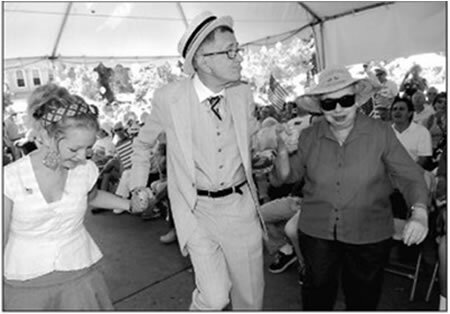 Rabbi Leonard Helman dances with Sarah Barba, left, and Gracie Olivas to the music of the Santa Fe Concert Band during Pancakes on the Plaza festivities on the Fourth of July. Rabbi Helman was known for his cane-and-hat soft-shoe routines. Rabbi Helman was a man of paradoxes: a devout, observant Jew who believed in ecumenism. He attended Christmas Eve Mass at the Cathedral Basilica of St. Francis of Assisi every Dec. 24 for 30 years. Rabbi Helman was a benefactor of the Australian Bridge Federation and instituted two annual awards for youth bridge. He did likewise in several other countries. Leonard came into my life in the 1980s. He telephoned me one Saturday night after completing a locum in Brisbane. “I believe there is a bridge congress in Sydney tomorrow,” he said, “I wonder if you could find me a partner, please?” I could not resist the opportunity of partnering a bridge-playing rabbi and so began a long friendship. 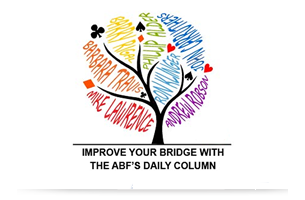 Leonard was the inspiration behind a bridge column titled ‘Thursday The Rabbi Played Bridge’. It ran for 20 years and the material in those columns was the basis for three books, ‘Kosher Bridge’, ‘Kosher Bridge 2’ and ‘The Rabbi’s Magic Trick’, written in conjunction with David Bird. Leonard loved his bridge and played in many USA nationals and also in internationals. In 1997 English expert Mark Horton received a phone call from Mario Dix, the President of the Malta Bridge Federation, to ask whether he would be interested in playing in the Malta Festival with a visiting American, Leonard Helman. It was only later that Mark discovered Leonard was a rabbi, but it seemed like a good idea. When the event was over and Leonard was leaving for the airport Mark said goodbye with a line borrowed from Casablanca, ‘ Rabbi, I think this is the beginning of a beautiful friendship’. Over the following decade or so Leonard and Mark played in some of the toughest events in the bridge calendar and against many of the world’s finest players. Mark has written a book about Leonard and ‘The Rabbi’s Rules’ is due to appear in a few months. West switched to the D9 at trick 2. From the play at trick 1 and the bidding, South deduced that East had three spades and six diamonds. South rose with the DA, crossed to the HK, finessed the H10, played the HQ and came to hand with the CA. He cashed the HA and led a spade. That set up the SQ to discard his losing club. Later he led a diamond towards the DQ and thus came to ten tricks and +620. South played a diamond to the ace and ruffed a club. The DK was followed by a diamond ruff and the SQ from dummy was covered by the king and ace. South led a diamond winner and discarded a spade from dummy. East ruffed and returned the HK. Declarer won with dummy’s ace and led a club. East could not gain by ruffing and discarded a spade. South ruffed and crossed to the SJ. That was nine tricks for declarer and a club from dummy allowed South to score the HJ en passant for his tenth trick and +790. Rabbi Richard Margolis, who often played bridge with Leonard, a Gold Life Master, described him as ‘always honorable, always ethical, always there for those who needed someone’. Playing bridge is the Aldzheimer’s prevention club.